In the past, I used a (chaotic) mix of planners, digital calendars, desk pads, and random notes to keep track. But a year ago I stumbled upon the bullet journal planning system and, step by step, united all my planning in one place. No matter if an editorial calendar for my blog, a budget, or simple to-do lists. If YES: I've got a complete month of creative but simple bullet journal layout ideas for you! If NO: I know that the system can look intimidating, especially if you jump in all at once. But I started out with just collecting all my daily to-do lists in an old notebook and gradually added more layouts, calendars, and in-depth planning - you can do that, too! If you've been curious to try journaling, just pick a specific layout idea out of the seven I've collected that interests you and start to play around with it! Cover pages for a new month are the perfect place to start if you just want a moment to reflect, doodle, and be creative. No matter if you use a planner, a random notebook, or if you keep a journal: Take a look at the month ahead (even if we're already in the middle of it - just jump in!). Maybe try your hand at calligraphy! Add a tiny calendar to get a sense of what's coming. Write a line or two reflecting on the last month. If you don't have a yearly overview on another page, mark important dates like upcoming birthdays or events. Doodle - from plants to geometric forms, there are so many ideas you can find on Pinterest or Instagram! There are printable coloring pages to use, too! Who else loves mind maps? Even before I started a bullet journal, I always used mind maps in my blank notebook or on a large desk pad to get more perspective - especially when I had to juggle university projects and my publishing deadlines! A project overview in mind map form allows you to get a rough overview of everything you've got going on - and you'll quickly see which part of your life will probably need the most attention! It's simple and effective and a great basis to then build upon in your editorial calendar or daily to-do lists. I use a star constellation format for this mind map but the possibilities are endless! You can use the classical circles-and-lines format, or just group tasks together with simple dots. As you can see, I only have a few commission projects in February (but those two are larger ones, so will take up a lot of time...) and lots of ideas for blog posts! I'll fill in the stars as I complete each of these tasks, but have a more detailed blog planner based on this mind map. A mind map like this isn't for specific deadlines or details, but a great reminder for small and large tasks and how they're related! 3. Need More Consistency and Balance? Habit trackers are such a fun way to keep up with all those tiny tasks or, well, habits that otherwise get lost during busy days. Don't go overboard! If just sticking to your habits each day consumes hours, there's no way you'll be able to keep up. DAILY HABITS - small things that aren't time-consuming but have a huge impact on my health and productivity if I just keep them up! Another favorite daily habit is what I call "Clean 15". Just 15 minutes that I spend on tidying up random parts of our home. RECURRING TASKS - slightly larger and time-consuming habits that I don't want to do daily, but regularly. Meal Prep, for example - I want to see how often I actually meal prep, but there'd be absolutely no point to meal-prepping every day! Exercise: I have a general "Exercise" category that I track in my daily habits, but I split it up in smaller categories like Yoga, taking walks, and weight lifting so that at the end of the month, I can see how those balance out. Blog Posts: I would never be able (or even want!) to stick to a daily blog post schedule but love adding a star to my habit tracker whenever I post all the same. You can see how I use this habit tracker system in this blog post with a focus on the moon & stars aesthetic. To make it easy for you to set up, I created printable versions - drawing those circles for each day takes up way too much time! Simple habit trackers can be anything from dots to colored-in squares. 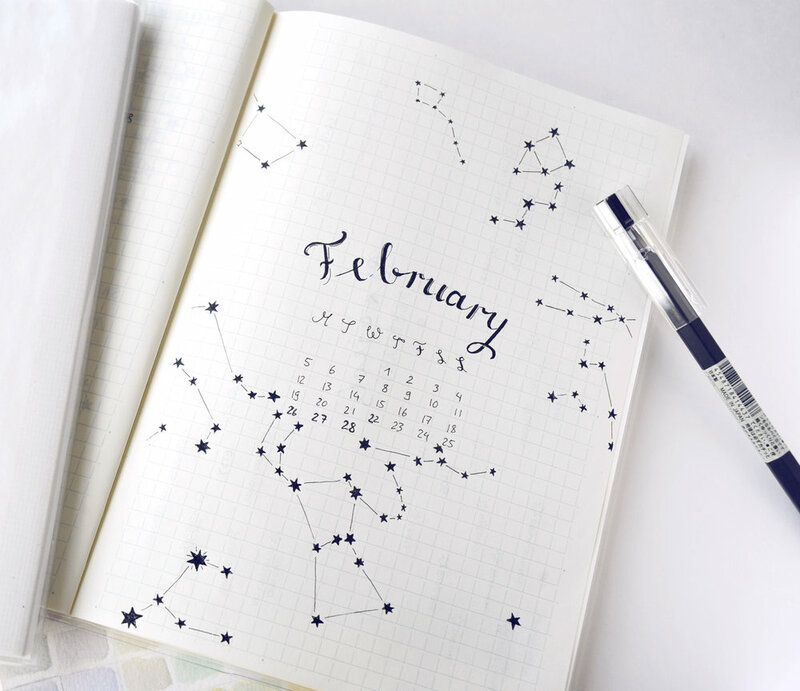 Or just using stars instead of the dual habit tracker - you can use a printable to glue in your diary or notebook, or draw one yourself. Carefully choosing your daily habits and recurring tasks is a simple way to make sure that at the end of the month, you've invested time and effort into what matters to you! If you want to get printable files from Etsy (there are so many great bullet journal artists that make their layouts available there!) you can use Ebates to get cashback on your order. If you sign up via my referral link, a bonus 10$ is added on top of that. If you use social media, you'll probably want to track those numbers, even if just for fun! I added a cute little doodle tracker for my Instagram this month. Not only am I keeping track of follower numbers, but also to remind myself to host another giveaway once I hit 3.5k! A new addition is my "Strength" tracker. I recently got new dumbbells (7kg) and will write down my sets/repetitions for some basic weight lifting exercises. I think I'll just add my stats for the first of February, and then another overview at the end of the month to see if I've gotten stronger. Similarly, I added a little tracker for my comic project... You can really keep track of anything you're working on in a creative way! Mood trackers and reading lists are a common addition, too. A budget challenge tracker can fit next to a list of expenses. For this month, I'm trying to be super strict with groceries. We had family visiting in January, and my Mother-in-Law bought all kinds of fruit and vegetables for me (many Koreans think that this is all Vegans ever eat) - I loved that we had cherries and pineapple in the house, but it also made me aware of how quickly those little luxuries add up! I'm pitting my passive income via Etsy against our grocery shopping! A side-income balancing out hobby supplies, a recurring task after which you reward yourself - or you can just track different categories of spending like this. Each filled in block is another 10$ (or 10'000 Won) spent. I'm in charge of not only household finances (my husband takes care of our cafe income and expenses) but lots of small income streams from my commissions, products, and of course my freelance jobs. While I actually enjoy drawing up and sticking to budgets, it does get overwhelming. Little challenges like this are a nice visual reminder that even small changes can impact your budget positively. This super simple blog planner is based on the blog post ideas I'd previously listed in my Project Mind Map. I wanted to break each blog post down into smaller tasks and add a rough publishing date estimate. Publishing date. I just wrote "W1", "W2" and so on to mark which week of February the post should get finished. That way I'm more flexible while still having a big picture in mind. Categories. If you don't post in only a single niche, it's a good idea to keep track of different blog categories. I try to balance bullet journal posts, food/travel posts, and art/creativity posts. Write down if you want to create any additional content like printables! The most important part of a bullet journal is, for me, the daily to-do list. Since the bullet journal system is completely customizable to your personal needs, I like playing around with these! Work | Freelance job and commission pieces) - take up most of the time! Life | Personal development, exercise, social stuff, housework - all those random bits go here! You can choose between so many different layouts for daily lists like these! I personally like to stick to a very simple layout but with added creative details like the doodles and graphs above. It's quick to set up but still looks cute and makes me happy! If you're completely new to the idea of bullet journals or got overwhelmed by the sheer amount of possibilities, I really love this guide that takes you from the very basics of planning in a journal to the more complicated (but fun and creative!) parts like hand-lettering, decorations, and special page ideas. You can get a complete month of Skillshare Premium access for free as a reader of my blog! So if you're about to tackle journals, planning, a blog, a creative project of any kind, you really need to check out their vast library of well-made tutorials - I've learned so much myself through Skillshare. For all subscribers to my newsletter, this printable weekly layout is available in my library just during February. If you're into the outer space aesthetic combined with simplicity, I've got you covered. But there are many more layouts you can try to find one that suits your schedule! Sign up with your email address to receive passwords & news! I hope I've given you some ideas for your own planning, no matter if in a random notebook or a dedicated bullet journal! As long as you can combine productivity with creativity, any planner system will work! How do you keep track of projects? Did you try bullet journals or other planners?